The Secret World, a daydream shadow of our reality, waits for you. Break down the walls of disbelief... join modern-day angels, dragons, elves, vampires, mythic gods, nightmare lords, immortal grail knights, werewolves, and others on adventures in lands of legend, myth and terror. The Everlasting is an epic modern day fantasy and supernatural setting with a fully developed mythology and culture for each race of Eldritch. 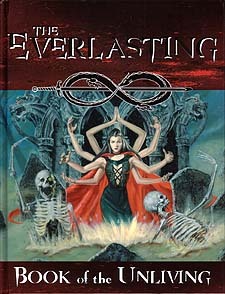 This first of 4 Foundation Books for The Everlasting is a complete roleplaying game. It introduces you to the darker side of the Secret World and features Dead Souls, Deathmech Cyborgs, Chuls, Grim Reapers, Reanimates, Revenants, Vampires, the Catacombs, the Underworld, and much more. Each Foundation book is a stand-alone game, but all of them are fully compatible with one another. Your journey into the realms of modern-day fantasy, horror and mystery begins now. Enter the magical world you have always wanted to visit... the one you live in.